Anyone who works to deliver a product or service knows the importance of customer satisfaction. Yes, that is why we are in business – to satisfy the need of a customer who is purchasing our product or service. Making a good product is one thing but delivering it to your customer in a way that leaves them happy and wanting to do business again with you is another. This is what customer satisfaction is all about. It is about ensuring that your customer feels important at every stage of the buying process and with every interaction they have with your company. And there are numerous necessary opportunities for customer interaction in the buying process – from the initial product inquiry on-line or by phone to the various steps involved in confirming the customer need, delivering the product, administering the financial transaction and finally to any service and warranty follow up after the purchase. If your company fails at any stage of this process, you will have a less than satisfied customer which will translate into a loss of business now or in the future. Understanding how your customer is feeling about their experience with you, your business and your product or service has become more important than ever. Markets are competitive so customers can easily find another company or product if they are not happy. And, communication can travel fast – good and bad. And truly successful companies will know that customer satisfaction means not just meeting customer expectations but exceeding them. For each and every completed PACLINE project, our customer service department sends out a Customer Thermometer to gain valuable feedback from that customer about their recent purchase and overall experience with PACLINE Corporation. There are four rating options: excellent, good, average and poor that are displayed by either a gold star or correlating ‘smiley face’. Once the customer clicks their chosen rating it takes them to a page where they are able to leave additional comments. From these comments we are able to gain insights into what we have done right, how satisfied customers are with our service/product, learn what we could do better next time and get an idea about how our customers feel about their PACLINE experience. Our goal was to develop a survey that was not time consuming, but also allowed a way for our customers to provide detailed feedback and comments if they wanted to. 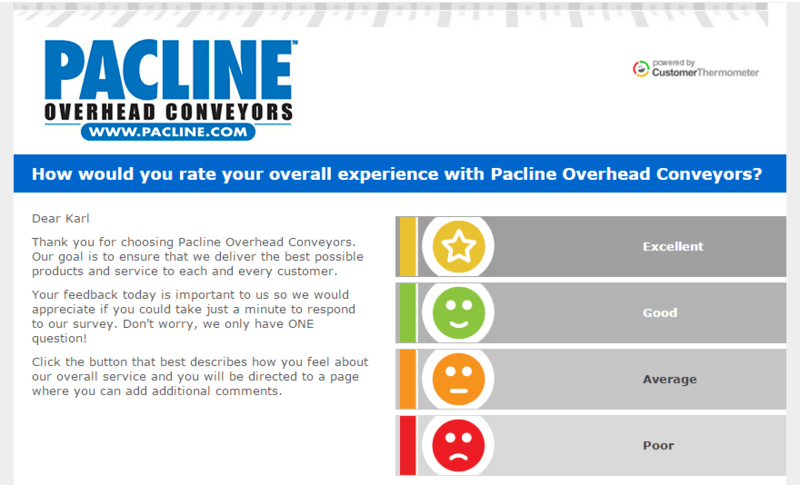 By setting up Customer Thermometers we are able to re-enforce our commitment to excellent customer service as well as support our claim that PACLINE Corporation is one of the most trusted conveyor manufacturers in the world – the results speak for themselves.